In the last article we discussed the basics of Electrical Power and related terminologies. Here we will develop the concept of Complex Power and Power Triangle. These two are very important concepts used frequently by power engineers. As this article requires the knowledge of previous article so it is advised to at least have a look at the last article. From the previous article the following points are clear. The instantaneous power p is composed of real power and reactive power. It should be remembered that real power is the average value and the reactive power is maximum value. 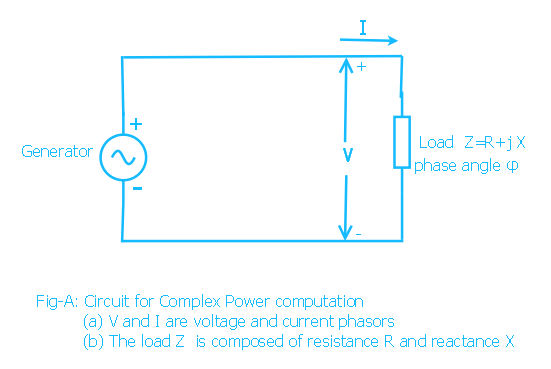 In power system analysis the concept of Complex Power is frequently used to calculate the real and reactive power. Let voltage across a load is represented by phasor V and current through the load is I.
V is the phasor representation of voltage and I* is the conjugate of current phasor. So if V is the reference phasor then V can be written as |V| ∠0. 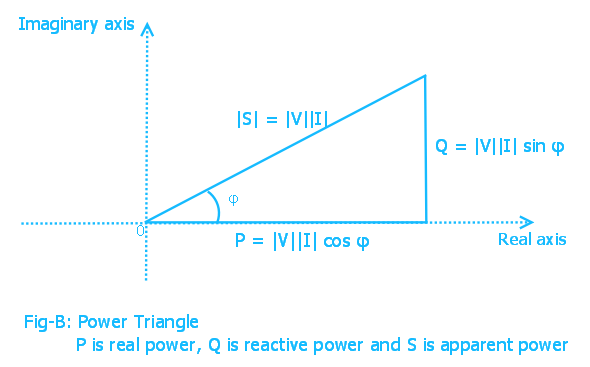 The real part of complex power S is |V| | I | cos φ which is the real power or average power and the imaginary part |V| | I | sin φ is the reactive power. It should be noted that S is considered here as a complex number. The real part P is average power which is the average value, where as imaginary part is reactive power which is a maximum value. So I do not want to discuss further and call S as phasor. If you like more trouble I also advise you to read my article about phasor or some other articles on phasor and complex numbers. Returning to the main point, from the above formula it is sure that P is always more than zero. Q is positive when φ is positive or current lags voltage by φ degrees. This is the case of inductive load. We previously said that inductance and capacitance do not consume power. The power system engineers often say about reactive power consumption and generation. It is said that inductive loads consume reactive power and capacitors produce reactive power. This incorrect terminology creates confusion. The fact is that most of the loads are inductive and they unnecessarily draw more current from source. Although in each cycle both inductance and capacitance draw power from the source and return same amount of power to the source but the behavior of inductance and capacitance are opposing to each other. When capacitors are connected in parallel to inductive load the power requirement of inductive load is supplied by capacitor in half cycle and in next half cycle the reverse happens. 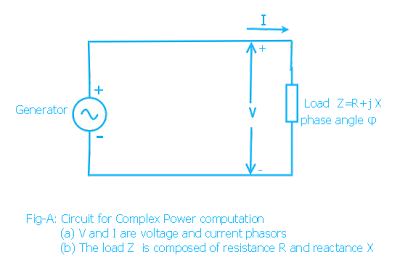 Depending upon the values of capacitor this power requirement of inductance in the load may be fully or partially satisfied. If partially satisfied the rest will be drawn from the distant source. By properly selecting the capacitance the maximum value of reactive power (Q) drawn from the distant source (or returned to the distant source) is reduced. This reduction in reactive power results in reduction of line current so the reduction of losses in transmission line and improvement in voltage at load end. 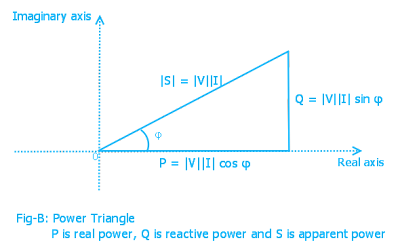 Returning to the complex power formula, P, Q and S are represented in a power triangle as shown in figure below. It is measured in VoltAmp or VA.
P is measured in watt and Q is measured in VoltAmp-Reactive or VAR. In power systems instead of these smaller units larger units like Megawatt, MVAR and MVA is used. The ratio of real power and apparent power is the power factor of the load. 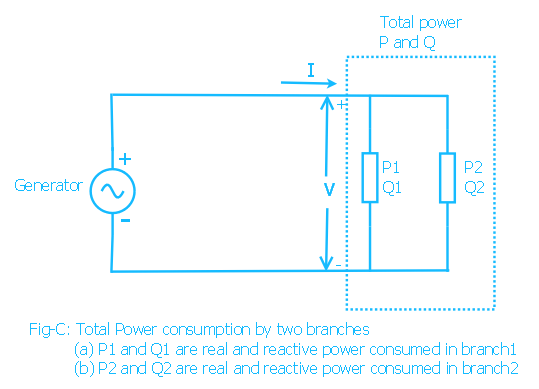 The reactive power Q and apparent power S are also important in power system analysis. 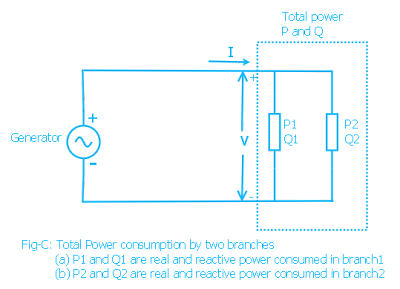 As just shown above the control of reactive power is important to maintain the voltage within the allowed limits. Apparent power is important for rating the electrical equipment or machines. In real world the loads are usually connected in parallel. Here we will show the total power consumed by parallel branches. See Figure-C. It has two branches. 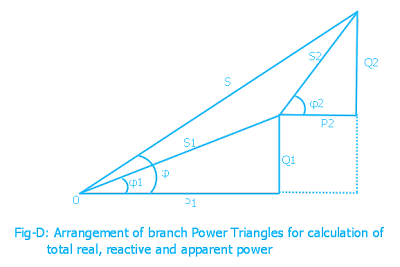 First we have to draw the individual power triangles for each branch. Next the power triangles are arranged back to back keeping real power in positive x direction as shown. 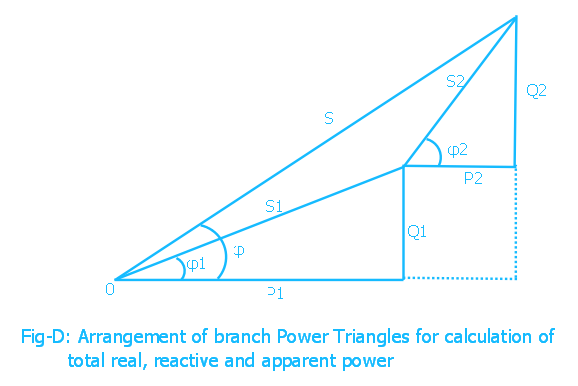 The total power consumed is obtained by connecting starting point O to the tip of last triangle. This is actually the result of addition of complex numbers. In the above diagram S1 P1 , Q1 and φ 1 correspond to branch1 and S2 P2 , Q2 and φ 2 correspond to branch2. but why do we use conjugate of current than the original phasor in the calculation? Can we apply same calculation technique for measurement of power loss in inductor?